I got this juvenile Harley at a local show and I believe its a male. I love how solid and white his sides are. 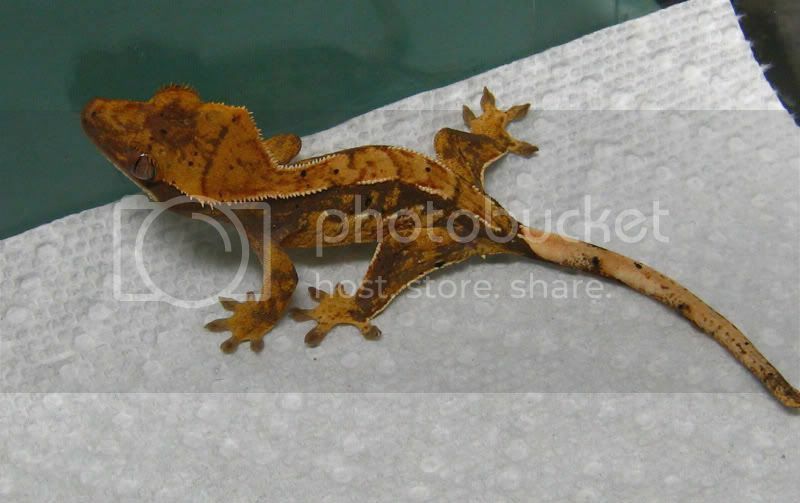 I have no idea what the parents look like so I dont know of he will be more of a cream animal or more orange??? The other new one is a Yellow Tiger. I know Tigers arent the most popular but this guy has a nice Mustard color when fired up and has a huge crest for a little 5 gram animal. 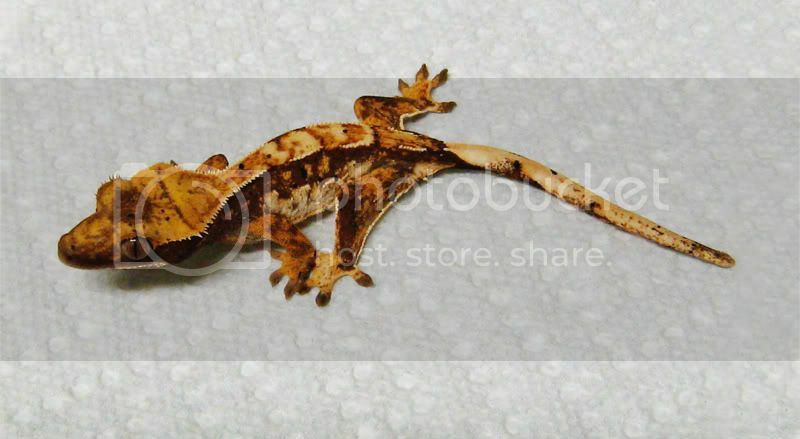 Both gorgeous cresties, nice score! The colour on the first is really nice and I really like the nice "snakey head" on the tigers tail. That first one isn't the probable male you picked up from me is it? It looks a lot like some of the partial pins I brought to the show, but I don't remember the one you bought having that much white on the sides. Just curious. They are both very pretty!!! I do like the high contrast in the first one. That first gecko is killer!! Here is a pic of him the day after I got him from you. The more I looked at him, the more I was sure it was my gecko. That cream has really intensified in only a couple of weeks. 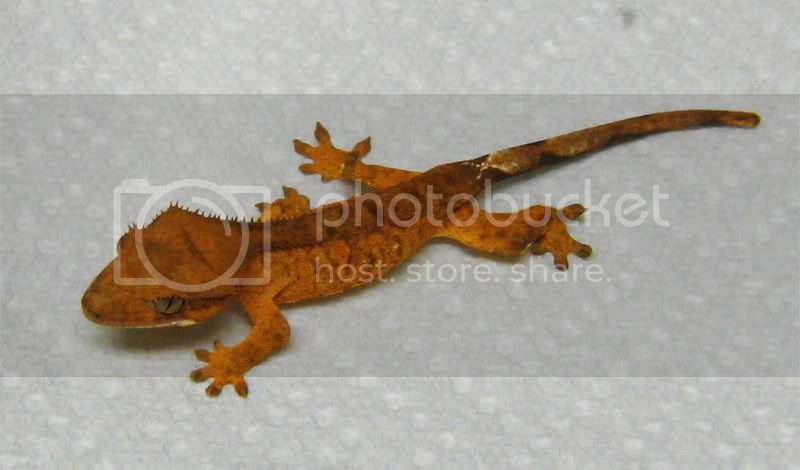 He's a good example of why I usually hold back quite a few geckos until they are 15 - 20 grams. By then you know where there colors are going and you've seen them fired up enough times to know what they look like when they are at their best. I just didn't have many geckos for that show so the night before I pulled a few of the younger ones that normally I'd hold on to a little longer. Thanks for the updated pictures. Always nice to see the geckos progress. As for not knowing anything about the parents... if you can remind me what the label said when you bought him, I could tell you a little bit about his background. Was the sire "Pins" or "Yeller"? I'm a very big fan of tigers and high contrast flames/harlequins. Those two look great! gary, you have some gorgeous animals!